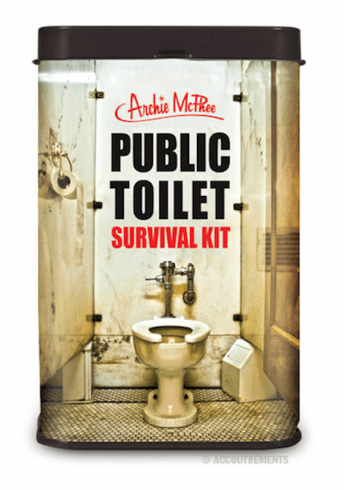 You never know when you're going to encounter a public toilet with some cleanliness issues, so make sure you're prepared with this Public Toilet Survival Kit. Each kit includes one toilet seat cover, two antiseptic wipes and one pair of latex-free disposable gloves which should be enough to keep you safe and sanitary in even the most challenging conditions. Do yourself a favor and keep one of these 3-3/4" (9.5 cm) tall metal tins with you at all times when you travel. You'll thank us later.